What's New in Roller 4.0 - Apache Roller - Apache Software Foundation for your Wiki! Apache Roller 4.0 is a major new release which includes easier blog theme customization, a much more simple installation/upgrade process, infrastructure improvements and numerous other small fixes. This page provides an overview of the major features and improvements in 4.0. 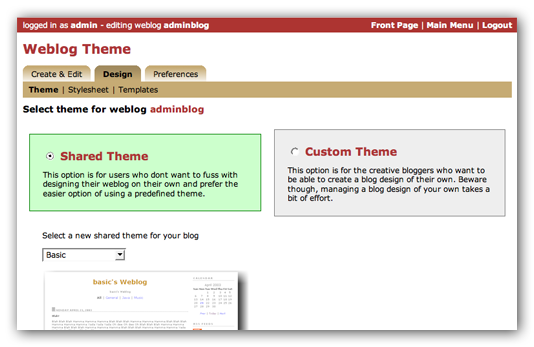 In this release, we worked to make it easier for folks to customize their blog's look-and-feel. We also made general improvements in the theme and template handing. First, we've rearranged the Roller user-interface and moved the theme-chooser and template editing pages to their own tab. As you can see below, we now have a design tab that includes all theme/template functionality and we've improved the theme chooser to better explain shared and custom themes. Next, we've made it easier for folks to customize look-and-feel without editing Roller theme templates in a couple of ways. Style-sheet overrides ROL-1368 Even if you know HTML and CSS it can be fairly difficult to customize the look and feel of your Roller-based blog. You might know what HTML and CSS need to be added or changed, but figuring out where exactly to make changes in themes can be difficult. To make it easy for folks to change theme colors and fonts, we've introduce the notion of a style-sheet override for each theme. Roller themes can now include a style-sheet override file and if you want to set your own colors and fonts, that's the place to add and change CSS. About this blog message and blog image ROL-1366 Most blogs include a short "about this blog" message and an image, which is either a mugshot of the author or the icon/logo of the blog. So we've added new fields to the weblog settings page so you can set these for your blog and now Roller themes can include these fields in a standard way. 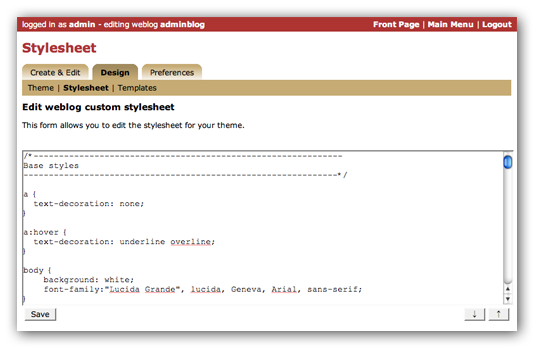 You won't be able to take advantage of this feature unless you are using a theme that has been updated for Roller 4.0. And we also made the template editing system a little more powerful for those not afraid to hack templates and modify Velocity code. Templates by action ROL-1310 If you want to have different content on your blog's entry page, search page or tags-index you no longer need special logic to test which page you are on. Instead you can add a page to be associated with each action and we support actions permalink, tags-index, search or custom. Template editor enhancements ROL-1451 For those using Roller templates to define custom pages that generate XML and JSON and other content type, we've added a content-type setting to the template editor page. We've also added a language setting for Roller installations who wish to plug in their own view technologies (i.e. to use a template language other than Velocity). Roller's install process has always been a sore point so in 4.0 we've done the work to make installation really easy ROL-1448. Assuming you've already setup Java and your Servlet container, all you have to do for Roller is to create one little settings file and deploy the Roller WAR. There's no need to setup a JNDI data-source or mail-session (unless you want to) and there's no need to create tables. Plus, there's no need to download Hibernate separately because Roller no longer needs Hibernate. On startup Roller will test your database connection and give you detailed error messages if it fails. Roller will automatically setup tables for you and you'll be up and running in minutes. Make it possible to plugin multiple comment validators and provide set of "default" validators for blacklist, excess-size, excess-links and for the Akismet spam prevention system. The biggest changes are under the hood. In Roller 4.0 we've upgraded the foundations upon which Roller is built. Roller now requires Java SE 5, now uses Struts2 ROL-1439 instead of Struts1 and now includes a new JPA-based back-end implementation that completely replaces Hibernate ROL-1447. There are also numerous small fixes and improvements in Roller 4.0. Get the full list of issues addressed in Roller 4.0 via our JIRA issue tracker.